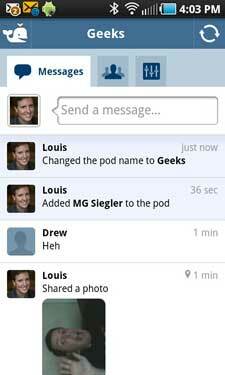 Simple social apps, from photo sharing to intimate networks, to group texting services are gaining in momentum with the success of TextPlus, GroupMe, Path, Instagram and others. A new entrant to the scene is a company called Beluga, not to be confused with the Fail Whale, headed up by a small team of 3 ex-Googlers who hold pedigrees from Google AdSense, Google AdWords and Gmail. The slick product has dedicated applications for both Android and iPhone platforms, and chat archives are accessible through the company's Web site as well. 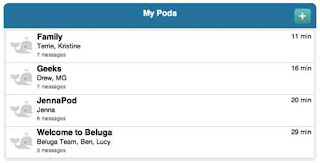 Diving into the trend of more intimate social networking, where you can share with a small group of people instead of broadcasting to an unfiltered list of friends on Facebook and Twitter, Beluga asks you to create "Pods", like groups, of people, and you can send text messages, complete with photos and embedded emoticons, to those in the Pod. The service helpfully taps into your phone Address Book so you don't have to remember everybody's number, and it lets you connect with Facebook to find friends who may already be in Beluga as well. 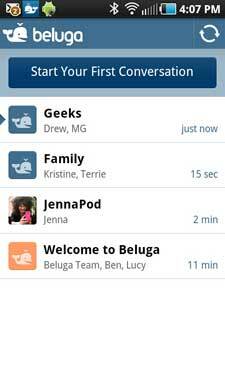 As one tech friend suggested (within Beluga), the service is actually a lot like Brizzly's Picnics feature, but mobile. 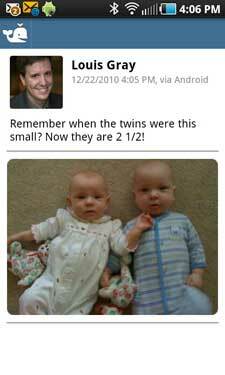 I quickly found myself sharing photos of my kids to both my wife and my mom within the app, and setting up separate lists for Geeks or other contacts. Behind the app are a trio of former Google employees, including Ben Davenport, Co-founder and CEO, who sports Google AdSense on his resume, Lucy Zhang, Co-founder and President, who helped design AdWords, News and Docs while at Google, and Jonathan Perlow, also a co-founder, and CTO, who was a senior staff engineer at Google, with responsibility as the tech lead of the Gmail front-end team. He also lists Gmail Chat and Mail Goggles among his successes. Beluga's approach asks you to "Start a Conversation". Add a person by name, email or phone number, and keep adding until you have the right folks. Then you can start sharing. On Android, the app leverages your existing photo gallery or prompts you to take new photos if you like. For recipients who are not yet Beluga members, texts come from a 703 area code number, and include texts from both the initiator of the conversation and all respondents. 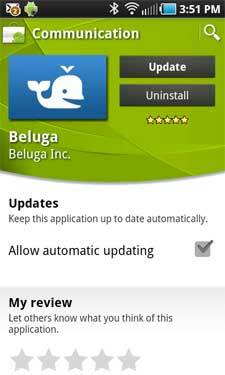 If you have Beluga installed, new updates can come as notifications within the app, and don't live in your central messages folder. textPlus has forged the way in this market with innovative pieces, including Communities, and photos, both items Beluga has from day one. You can find Beluga on the iTunes store or in the Android Market. If we're already connected on Facebook, you'll find me in your Beluga as well. As for the name? No fail whales yet that I can see. So that can't be the reason.